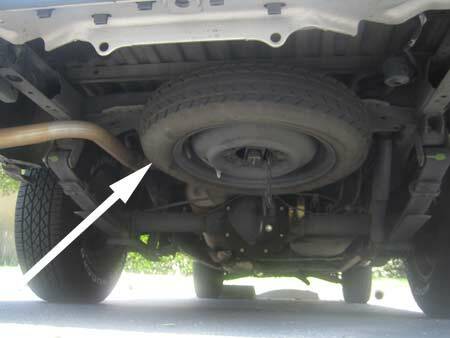 With a truck, the spare tire is often tucked away under the bed of the truck. 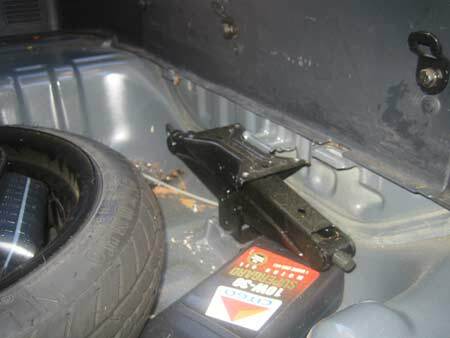 The tools are usually behind the seat of the truck, including a long tool to lower the tire. Volkswagen Bugs, Porches and some Subarus have the tire under the front hood. 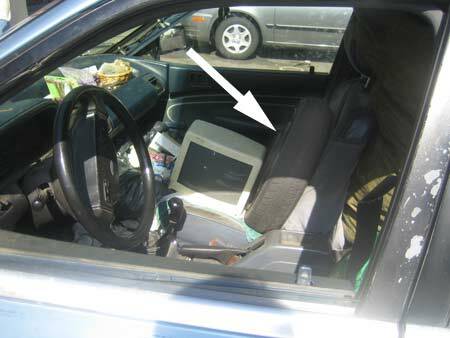 Don't forget to check the passenger seat, next to your laptop. 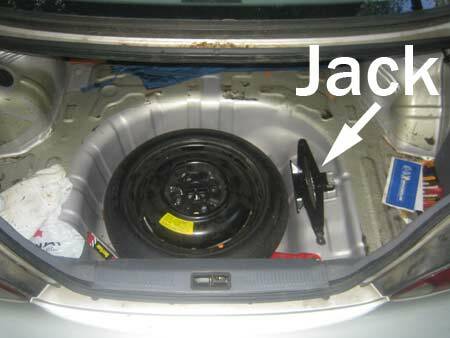 When you find your spare tire, you should also find some tools: a jack, a lug wrench and a tiny shepherd's hook. You will need all of these. You might be able to get the job done without the shepherd's hook, but it would be tough. Also, you might need a security-nut key if your rims use a security lug nut. More on this later. The jack might be wedged into a little nook. Because it can expand and contract, the jack is usually pressing against the walls of its nook, keeping it secured in place, like the Alien holding itself against the sides of a closet in the escape pod. Turn the long screw through the middle of the jack to flatten it, so that it can be easily removed. The tools for my Hyundai are kept in a heavy black cloth carrying case. If you are driving a really nice car, your tool sack should be full grain leather. Don't have a nice tool sack? Try the leather tent at the renaissance pleasure faire. Because the spare tires on trucks are stored outside the vehicle, where they are vulnerable to thieves, you may have to perform some tricky maneuvers to get to them. 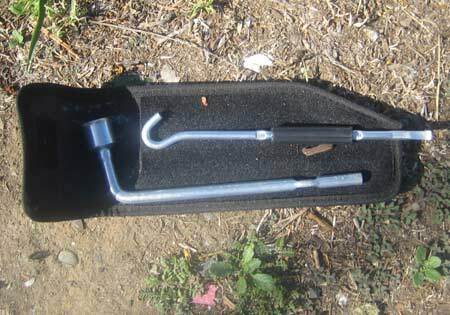 Jerry's truck included this long metal tool. 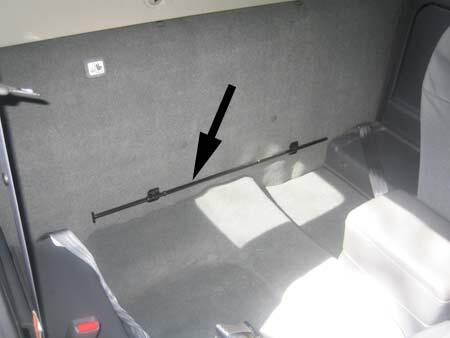 Which is used to access a hidden spare-tire lowering screw. 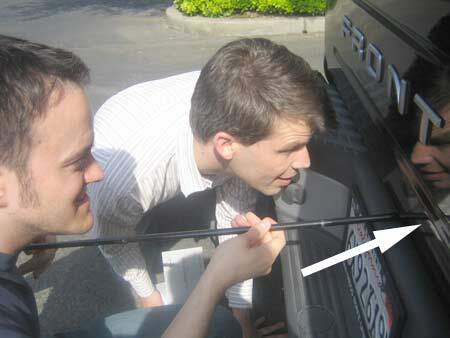 Please continue reading page 3 of Easy, Illustrated Instructions on How to Fix a Flat Tire.